Below are two responses to the subject message. 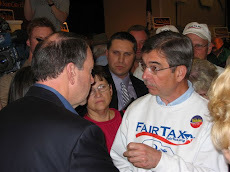 The first response takes up my challenge to those of us who know the benefits of the FairTax for America to get behind it & spread the word with no quit or fatigue – the point to be careful of is that you don't wear yourselves out contacting worthless politicians but rather spend your time finding new ones who will make a difference. 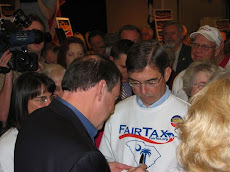 The second response amplifies the importance of learning the principles of the FairTax properly. Yes Doug - we all must work extra hard; however we have very strong arguments. Push the FairTax relentlessly while arguing the IRS is obsolete with today's retail and sales technology. Challenge the socialist leaning politicians to answer how a cost of $430 billion a year adds a single dollar to GDP. Clearly it subtracts substantially from GDP growth. This is $430 billion cost in complying with our lobbyists' corrupt tax code. In a town hall or other encounter I would love to confront Senators Menendez or Lautenberg as to how they justify the IRS and the $430 billion subtraction from GDP? I will write to them again today demanding a specific response and not a canned tax policy response. Reply to Response #1. Do not hold your breathe - Senators Menendez or Lautenberg will not respond - why ?. Your way does not jive with their thinking.